Made a nice if small discovery. While accompanying a field trip, I noticed some unusual Greenbrier, (Smilax), plants. It wasn’t just that they were growing in the water, but the color of the berries was not your typical purple/black of ones I’m used to. I snapped a couple of pics and, after downloading a couple of weeks later, identified them as Smilax walteri, Coral Greenbrier or Red-berried Greenbrier, sometimes called Red-berried Bamboo. 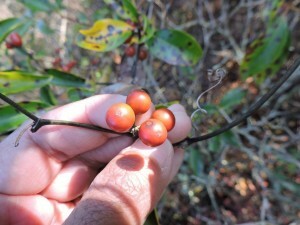 Berries of Smilax walteri can be orange to red according to the Flora of Virginia. What was strange was that I considered this a Southern swamp plant and a quick check showed it was not documented as growing this far North, reaching its limits in Southern Virginia. So I sent the pics to some botanist friends for confirmation. Turns out that it had not been found in Fairfax before, and that I should document it so as to update state records and to the range map for this species. In order to be accepted as a new County record, plants need to have a voucher specimen in an herbarium. I was asked to collect and press a voucher, as that is the major way to prove a find and have it be verified or studied in the future. The voucher is just a small clipping and there were actually quite a few plants growing there. I was given permission by Virginia Natural Heritage staff to collect the voucher from state lands, and it now is being pressed and dried in our Arlington herbarium. I’ve updated state records before, since there are a lot of species in Arlington that no one has bothered to document, and I’m trying to get Arlington back on the map, but this was a nice find by their standards too. Distribution of Smilax walteri, courtesy of the Digital Atlas of the Flora of Virginia. It’s always nice to find new things, and this shows you that there are still lots of small things that need to still be documented even in the DC area. It’s not that unusual to do. That pressed voucher adds another bit of information and expands the range for this plant. There are still many things still left for anyone to contribute as citizen science to add to our knowledge of the natural world. Editor’s note: Habitat description from the Digital Flora indicates that you should look for Smilax walteri in alluvial, nonriverine, tidal, and maritime swamp forests, usually in seasonally flooded soils; less typically in saturated flatwoods and acidic seepage swamps. Found frequently in the Coastal Plain; rare in the Piedmont. 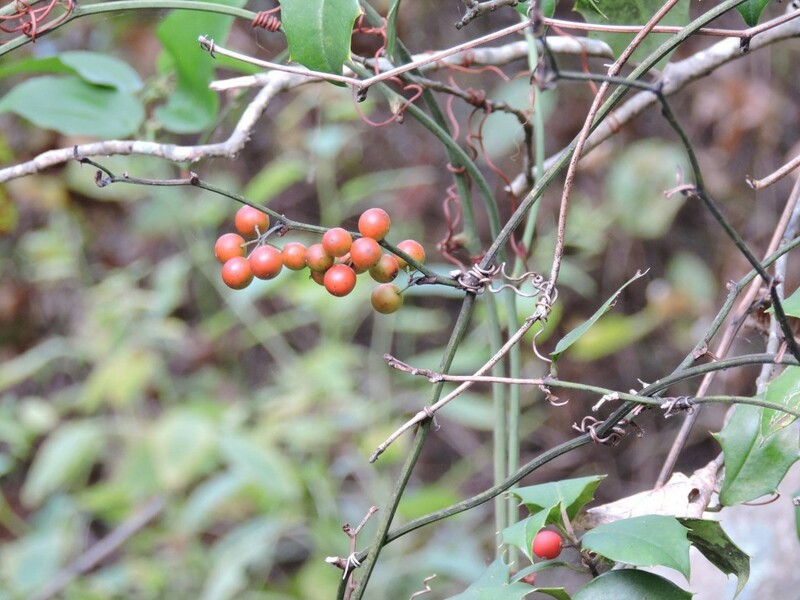 Read more about Greenbrier on our blog: Smile, It’s a Smilax!